The most popular kinematic motion add-in tool for SOLIDWORKS, SOLIDWORKS Motion ensures your design will function before you build it. Included inside SOLIDWORKS Premium, SOLIDWORKS Simulation Professional, and SOLIDWORKS Simulation Premium, SOLIDWORKS Motion is the standard kinematic and motion simulation add-in software for engineers and designers interested in understanding the performance of their assemblies. SOLIDWORKS Motion enables engineers to size motors/actuators, determine power consumption, layout linkages, develop cams, understand gear drives, size springs/dampers, and determine how contacting parts behave. The result is a quantitative reduction in physical prototyping costs and reduced product development time. SOLIDWORKS Motion also provides qualitative benefits such as the ability to consider more designs, risk reduction, and the availability of valuable information early in the design process. Leverage the power of SOLIDWORKS – Included as part of SOLIDWORKS Premium, SOLIDWORKS Motion uses existing SOLIDWORKS assembly information to build motion simulation studies. For example SOLIDWORKS Motion will automatically map SOLIDWORKS mates to derive motion joint conditions. 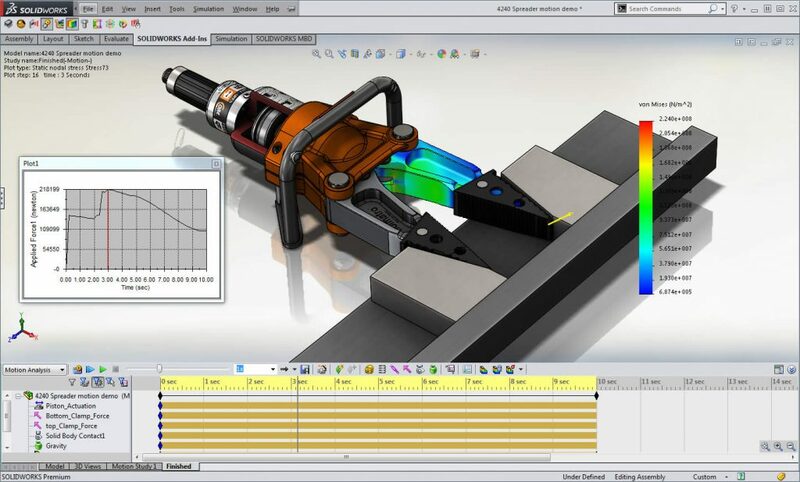 Transfer loads seamlessly into SOLIDWORKS Simulation to perform stress analysis – With the seamless transfer of loads from SOLIDWORKS Motion to SOLIDWORKS Simulation, you can visualize stress and displacements on a component at a single time instance or for the entire simulation cycle. Understand robotics performance during operation, for example, installing windshields, pick and place electronic components on circuit boards in electronics plants. Optimize or minimize the force imbalance of a rotating system in orbital sanders, sewing machines, shaker beds, drive-shafts, etc. Represent interactions between various gears (spurs, work, helical, and rack-and- pinion) used in different kinds of power transmission or motion control. Associate physics-based models to engineering conditions – SOLIDWORKS Motion offers several types of joint and force options to represent real-life operating conditions such as compound joints like hinge, screw, universal, input functions like step and harmonic, linear and non-linear springs, forces, moments, 2D and 3D contact to capture interaction between parts, etc. Interpret results with powerful and intuitive visualization tools Once you have completed the motion simulation run, SOLIDWORKS Motion offers a variety of results visualization tools in the form of XY plots or numerical data of displacements, velocities, accelerations, force vectors at joint locations, displaying a trace on any point of the body during the entire simulation, check for colliding parts while the assembly moves, etc. Collaborate and share analysis results – SOLIDWORKS Motion makes it easy to collaborate and share analysis results effectively with everyone involved in the product development process. Use video AVI, SOLIDWORKS eDrawings or VRML formats to capture and communicate the physical motion to others. The SOLIDWORKS Motion Add-in is part of the SOLIDWORKS Premium software bundle from Javelin. Interested in the SOLIDWORKS Motion Add-in?